A spokesperson for Regional Roads Victoria said the new roundabout would improve safety and reduce congestion. The intersection of Barwon Heads Road and Marshalltown Road, which functions as a feed for five roads, saw three serious crashes and many near misses over the last five years. 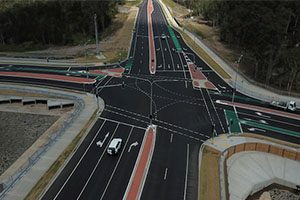 According to Regional Roads Victoria, the new design will make it easier for busses and trucks to turn at the intersection, helping to improve safety for all drivers in the region. The intersection upgrade also includes road resurfacing works, and the installation of a right hand turn onto Horseshoe Bend Road from Barwon Heads Road. Regional Roads Victoria said to increase safety, a permanent 60 kilometre per hour speed limit has also been introduced on Barwon Heads Road when drivers are approaching the intersection. The use of recycled rubber follows a trial in Melbourne last year, which saw 27 tonnes of recycled rubber used in Tyre Stewardship’s Equine Air paving product, which was installed on 550 square metres of the Pakenham Racing Club Tynong approach track. The project from inception to completion took four months to construct, with the rubber centre being installed over two days.